Saving Mr. Banks is the story of how the film "Mary Poppins" came to be. Tom Hanks is playing the role of Walt Disney. I've always wanted to see some form of movie about Walt Disney. Seems like it should be a pretty interesting story. “Saving Mr. Banks” traces Walt’s prolonged efforts to gain the rights to adapt “Mary Poppins” from author P.L. Travers. The movie highlights their 1961 head-bumping collaboration during the film’s pre-production. I've been reading a lot about this on ultimatedisney.com, and it really kinda feels like a dream. Also, you might get more replies by including the premise in the topic title, otherwise some people might not know what this is about. Of course, since Disney as a company is paranoid about sullying their own name, this partial biopic should be taken with a little more salt than usual. Edit: I didnt even know about it being a 2013 release. I mean, it was only announced a few months ago. I heard about this yesterday. This movie sounds like it could be interesting. I had to think about Tom Hanks as Walt Disney for a moment, but I think it works. Tom Hanks repeatedly visits The Walt Disney Family Museum and had interviewed Walt's relatives to make sure he gets it right. He'll do a fine job of it. Looks good. I'm a fan of both hanks and Thompson. Like the guys playing the Sherman Brothers(Edit: Jason Schwartzman is one). Lovely little moment where they try to hide the sheet music for Supercalifragilisticexpialidocious. Should also be noted that Kris Kyer will be in this film. Here's an audition tape for a commercial some years ago. And less noteworthy is Paul Giamatti. Looks like it'd be a great movie, always down for a tom hanks film and this seems like it'd be fantastic. Here's a video about the Sherman Bros. for those interested. That looks like it was taken from a Disney Treasures DVD. Either way, Nice find! And then there's also "The BOYS" documentary that was made a few years ago. The films PG-13 rating seems like an oscar-influenced decision. That trailer looks awesome! I look forward to this. This will save Disney from previous blunders. Greatly looking forward to it, already looking forward to getting it on DVD/Blu-ray release. ^or it will be their biggest blunder yet. BTW, I like Oz and dont consider that a Blunder. I'm not so sure how I feel about this. Ever since I heard it announced that Hanks would be playing Disney in this like a year or so ago, I kinda liked how Walt himself was never portrayed by anyone in film, but Hanks looks to be doing a pretty good job with handling it. I'll keep this on my radar now that a trailer has finally been released. I was just replying to how Professor Ven implied the company needed "saving from previous blunders". Took it to mean their entire live action catalogue of the last few years. Come to think of it, I liked John Carter more than I liked Oz. but that is irrelevant. Just saw BJ Novak on the cast list as Robert Sherman. This just keeps getting more awesome by the minute! Edit: and for those who are wondering, the song in the trailer is a great one by Katie Herzig called "Lost and Found". Got it on itunes after learning the name. Pretty damn sure he was referring to The Lone Ranger. Perfect exactly of why Disney never should go anything edgier than Pirates. 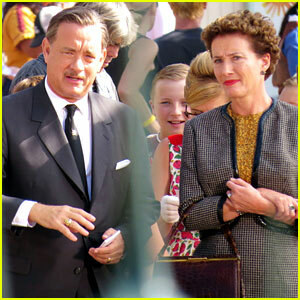 I think it is perfect that Tom Hanks is going to portray Walt. I can't think of a more perfect part. Yeah, that really was one, But only one. The Lone Ranger imo was a good, solid movie, but it had to compete with Despicable Me 2 and Monsters University for its audience (alongside other films in theaters, but those two are the first to come to mind). John Carter on the other hand, was imo a huge loss of 200-something million dollars (and it probably would have been a better movie had it not be made by another studio). Saving Mr. Banks will (or I expect it to) perform well in its quality (of both the movie itself and the representations of the people the actors in said movie are portraying), and in its sales. TL;DR: Disney made a solid move on getting money+quality on getting Tom Hanks as Walt Disney in this movie.